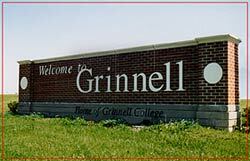 Welcome to Grinnell, a small, progressive city in Iowa's heartland! We take our living here seriously and we want you to know that you are welcome--whether for a short visit or for a lifetime. Quality of life is fantastic here--for raising a family, for obtaining higher education or for just plain living! There is opportunity here. Jobs are plentiful. Recreational and cultural opportunities abound for all age groups and abilities. There are interesting shops in our quaint downtown and there are many eating establishments--including several fine dining spots for those special times.